This film was shown through the Rooftop Films Summer Series on Saturday, July 18. Producer Zhao Qi was in attendance for a Q&A. 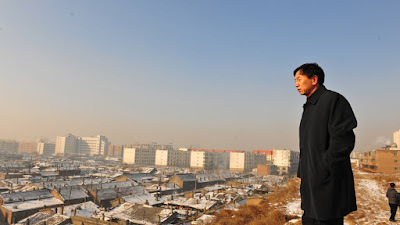 Hao Zhou's The Chinese Mayor is a rare glimpse into the inner workings of the Chinese government through the eyes of Geng Yanbo, the mayor of Datong, the most polluted city in China. Geng wants to reinvigorate Datong by making it a cultural city. This involves rebuilding much of the city, which means relocating many of its inhabitants. This divides the people of the city, some supporting him, some deeply against him. Geng believes he is doing good and wants to make his city a better place, but the all-powerful Communist Party gets in the way. The film won the Sundance Film Festival's Special Jury Prize for Unparalleled Access, and it's not hard to see why. Zhou's access to Geng and the citizens of Datong is virtually unlimited, and it's a minor miracle that this film even got made. As a distinctly unflattering look at the Chinese government, this film could have easily been shut down by the government, but for some reason, it wasn't. Rarely do we get a look inside a system like China's and even more rarely is it this intimate. What this film vividly reveals is a broken system, one in which everyone serves the bureaucracy, and no one wins. What's admirable about Zhou's film is that it doesn't make Geng out to be good or bad. It's a very even portrait of a very complicated man. Because of this, The Chinese Mayor is an excellent conversation-starter, one that could cause hours of post-screening debate. Overall, The Chinese Mayor is an eye-opener that's unlike any other documentary I've seen. It's insightful, even-handed, and powerful. What's disconcerting, though, is the fact that it is without, at this point, US distribution. A film like this cannot be ignored, and especially with all of the unworthy docs that get US distribution, it seems absurd that an acclaimed Sundance-winner with a timely subject such as this one hasn't been bought. If marketed to the right audience, The Chinese Mayor could have impact.